Polyester yarn dyed, 100% colorfastness and azo-free material used and suitable for export purpose product designed for footwear loopy and garments use. 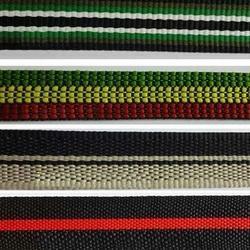 Having years of experience in domain, we offer large range of Footwear Loopy Tape. The offered product is used in textiles and garments industries across the world. We offer high grade quality and shrinkage resistant Footwear Loopy Tape to our clients. Besides these, our Footwear Loopy Tape is resistant to shrink. We are a remarkable entity, engaged in offering a superior quality range of Polyester Fabric Tape. This tape is manufactured in compliance with industry quality standards using premium quality materials with the help of contemporary machines. The offered tape is also tested on diverse quality parameters like durability, finish, strength, etc. It is highly demanded for use in bags. We offer this to the customers in different specifications at market leading rates. 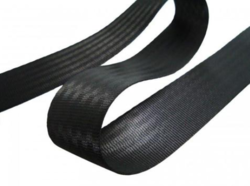 We are a remarkable entity, engaged in offering a superior quality range of Webbing Twill Tape. This tape is manufactured in compliance with industry quality standards using premium quality materials with the help of contemporary machines. The offered tape is also tested on diverse quality parameters like durability, finish, strength, etc. It is highly demanded for use in bags. We offer this to the customers in different specifications at market leading rates.